This book investigates fiction in English, written within, and published from India since 2000 in the genre of mythology-inspired fiction in doing so it introduces the term ‘Bharati Fantasy’. This volume is anchored in notions of the ‘weird’ and thus some time is spent understanding this term linguistically, historically (‘wyrd’) as well as　philosophically and most significantly socio-culturally because ‘reception’ is a key theme to this book’s thesis. The book studies the interface of science, Hinduism and itihasa (a term often translated as ‘history’) within mythology-inspired fiction in English from India and these are specifically examined through the lens of two overarching interests: reader reception and the genre of weird fiction. The book considers Indian and non-Indian receptions to the body of mythology-inspired fiction, highlighting how English fiction from India has moved away from being identified as the traditional Indian postcolonial text. Furthermore, the book reveals broader findings in relation to identity and Indianness and India’s post-millennial society’s interest in portraying and projecting ideas of India through its ancient cultures, epic narratives and cultural (Hindu) figures. 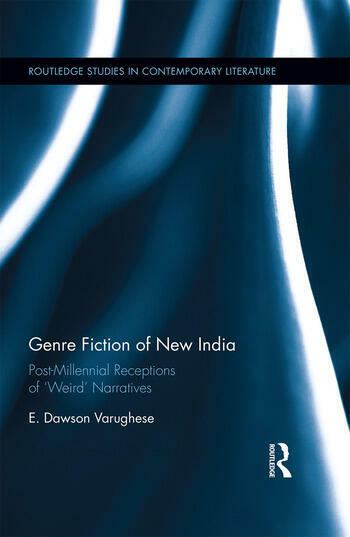 E. Dawson Varughese is an independent global cultural studies scholar and the author of Beyond the Postcolonial: World Englishes Literature (2012) and Reading New India (2013). She has published in Contemporary South Asia, South Asian Popular Culture and English Today.